Oracle DB File Sequential Reads Show Up in Full Table Scan? 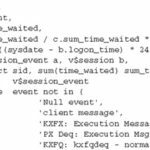 If you trace or monitor a full table scan operation closely, you may find db file sequential read events sandwiched between db file scattered read events. This may or may not be a problem depending on the circumstance of the single-block read. Following are the four primary reasons why you see db file sequential read events in a full scan operation. Extent boundary When the last set of blocks in an extent is only 1 block, Oracle fetches that block with a single-block read call. This is normally not a problem unless your extent size is too small. Following is an event 10046 trace file that shows db file sequential read events embedded in a full table scan operation. The table block size is 8K, the MBRC is 8 blocks, and the extent size is 72K (9 blocks). A full table scan against the table will result in many db file sequential read events if the table is large. If this is the case, the full table scan operation will complete faster if the table is rebuilt with a larger extent size. Cached blocks See explanation in the “Why Does a Full Scan Operation Request Fewer Blocks than the MBRC” section. This is not a problem. Chained or migrated rows It is a problem if you see many db file sequential read waits against a table when the execution plan of the SQL statement calls for a full table scan. This indicates the table has many chained or migrated rows. Oracle goes after each chained or migrated row with the single-block I/O call. Check the table’s CHAIN_CNT in the DBA_TABLES view. Of course, the CHAIN_CNT is as of the LAST_ANALYZED date. Migrated rows can be corrected by reorganizing the table (export and import, or ALTER TABLE MOVE). Index entry creation It is not a problem if you see many db file sequential read waits against an index when the execution plan of the SQL statement calls for a full table scan. In the following example, TABLE_A has an index and the db file sequential read waits were the result of reading index blocks into the SGA to be filled with data from TABLE_B. Notice the magnitude of the db file sequential read waits versus the db file scattered read in the statistics. This means you cannot always assume which bottlenecks you will see from looking at an execution plan. Most DBAs would expect to see a lot of db file scattered read events. Another point worth noting is that the db file sequential read wait event does apply to insert statements. The common misconception is that it only applies to update and delete statements.